At Pontchartrain Orthopedics & Sports Medicine, physicians specialize in the care of the musculoskeletal system—from the head to the feet—including bones, joints, ligaments, tendons, muscles, nerves, and related structures of the body. Their goal is to achieve 100% patient satisfaction from any medical or non-medical service provided, and to that end they offer a full-service, advanced facility where patient input is given the high consideration and conservative treatment is always considered before a rush to surgery. The practice treats orthopedic problems in adults and children and offers procedures such as arthroscopic surgery, total joint replacement, carpal tunnel surgery, and fracture management as well as sports medicine and worker’s compensation cases. Pain management services include interventional spine, ultrasound-guided injections, and Botox injections. With the welcoming of Dr. John Carradine, the practice truly offers comprehensive, “head to toe” services. Dr. Carradine brings years of experience in the surgical care of the foot and ankle to Pontchartrain Orthopedics & Sports Medicine and sees patients at both the Metairie and Boutte locations. Dr. Carradine is the newest member of the practice’s team made up of physicians John Burvant, MD, Charles Haddad, MD, Jeffrey Sketchler, MD, Michael Zeringue, MD, MPH, Joseph Finstein, MD, Keith Melancon, MD, Harold Stokes, MD, and Brandon Donnelly, MD. With an on-site physical therapy center in Metairie and another on the way at the Boutte location, these physicians work in tandem with Jeroen Klein-Staarman, PT, Alayna Kirk, DPT, and Chad Walker, PTA to provide well-rounded care from injury throuh recovery. 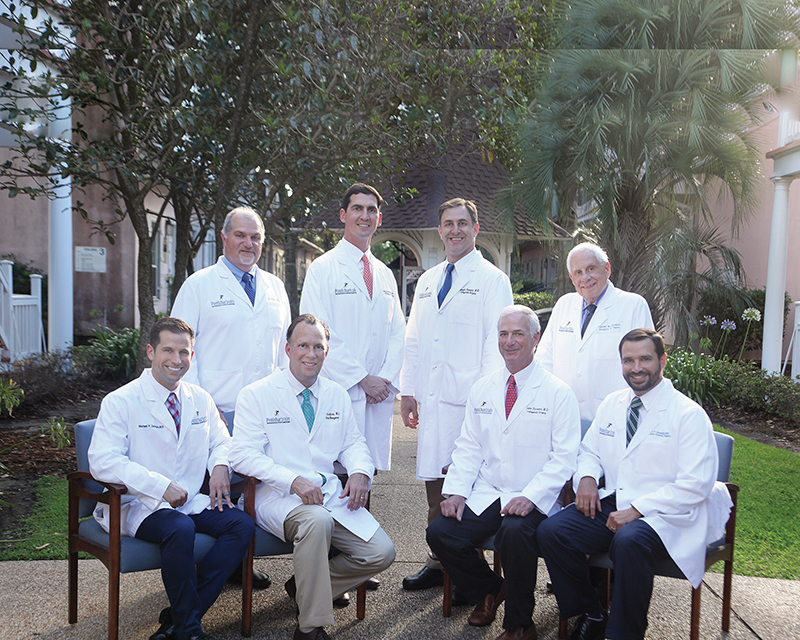 Pontchartrain Orthopedics physicians are proud to care for area students as team doctors—Drs. Haddad and Melancon at Hahnville High School, Dr. Haddad at Jesuit High School, and Dr. Finstein at De La Salle High School and team orthopedist at St. Charles Catholic School.